Although photography was invented in 1839, the art world at that time was still very much in the grips of Neoclassicism. To the Neoclassical sculptor or die engraver, modern clothing fashions changed too often, and to portray historically important figures in contemporary clothes could open up such art works to criticism. Instead, they froze their subjects in Classical Greek clothing and copied the stylized busts of known works by ancient sculptors and their later Roman imitators. Neoclassicism liked cold profiles, and the exacting art of die engraving is especially well suited to such a stylistic influence. In the United States, Mint engraver Christian Gobrecht was strongly influenced by Neoclassicism, which was especially apparent in his use of the classically stylized head of Liberty on the Coronet half eagle, which replaced the Classic Head design in 1839. 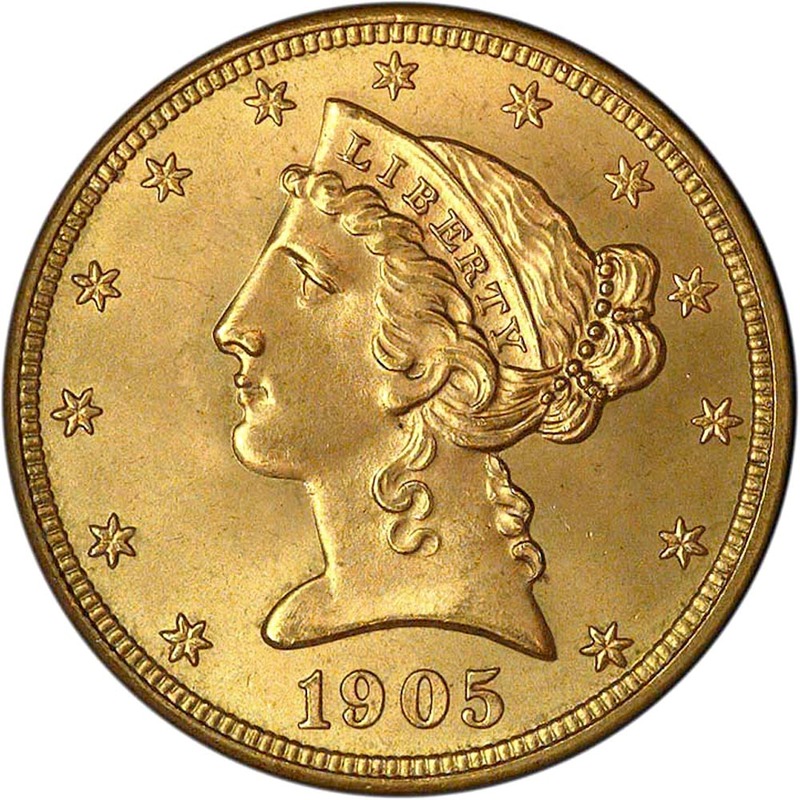 The obverse design of the new coin featured Liberty's hair tied in a bun and secured by a string of beads. She also wore a coronet in her hair inscribed with the word LIBERTY. The simplicity of the design was largely unaffected by the addition of the date below the bust and thirteen stars around the perimeter. Such a Greco-Roman profile as seen on the Coronet half eagle could be found in any major museum in Europe, and this classically elegant and yet simple design remained on the obverse of the half eagle until 1908, when the design was replaced by Bela Lyon Pratt's Indian Head. The reverse differed little from the spread eagle motif that had been in use since 1807, except that on the Gobrecht reverse the eagle's wingspan was widened to cover the new coin from rim to rim. Gobrecht's Coronet half eagles continued the Mint's preoccupation with stereotyping the designs on all U.S. coins. This drive for uniformity existed from the Mint's early days, and did not entirely vanish until new, non-mint designs were implemented early in the twentieth century. The Coronet half eagle shared its design with the eagle released in 1838 and the quarter eagle of 1840. Referred to by modern collectors as No Motto half eagles, they were struck in five mints: Philadelphia (no mintmark), Charlotte (C), Dahlonega (D), New Orleans (O), and San Francisco (S). Mintmarks were placed on the reverse below the eagle and above the word FIVE in all but the initial year of issue. In 1839 the C and D mintmarks were placed above the date on the obverse, making these otherwise relatively common coins a very popular and eagerly sought after year for collectors. All together, for the 28 years these coins were struck, a total of 9,114,049 pieces were produced from all five mints. In the first several years of production minor design changes were made—the head of Liberty was modified slightly after 1839, the diameter was decreased in 1840, and lettering and dates were enlarged in 1842 and '43. For the date and mintmark collector these minor design alterations provide variety; although—primarily due to engraver James Longacre's ineptitude as a die sinker—there are a considerable number of mispunched dates and overdates within the series that also provide numismatic interest. But the true rarities in this series are the low mintage, low availability issues, especially the branch mint issues from Dahlonega and Charlotte, such as the 1842-D Large Date, the 1842-C Small Date, and the 1861-C. There are no standout rarities among the New Orleans issues except, of course, for the legendary 1841-O, a coin that is unknown in any collection even though mint records indicate 50 pieces were struck—presumably all were melted after coining. The rarest regular production No Motto half eagle comes from the San Francisco mint—the 1854-S. Only 268 half eagles were struck in this first year the San Francisco mint was in operation, and today only three pieces are known. The most commonly encountered half eagles from this period are the ones struck in Philadelphia, with AU and mint state coins often available. The scarcest Philadelphia mint half eagles are those struck during the Civil War, when mintages were low and hoarding widespread. Grading well struck examples of No Motto fives is a rather straightforward process: look for rubbed spots on the highest portions of the design elements—the hair curls and above the eye of Liberty on the obverse and on the eagle's wings on the reverse. However, incompletely struck coins from this period are the rule, not the exception, and one should expect softness of strike on the hair curls of Liberty as well as the eagle's left (facing) leg on all branch mint coins and some of the Philadelphia issues. Counterfeits are occasionally seen in the series but are generally not a problem. Certain branch mint issues, especially those from the mid-1850s, may show full mint sharpness but dull surfaces. These "seawater Uncs." were allegedly salvaged off a sunken Confederate transport ship in the early 1970s. After receiving instructions from Treasury Secretary Salmon P. Chase, mint officials experimented with several mottos. After a succession of patterns in various metals and denominations were struck using mottos such as “God Our Trust” and “God And Our Country,” the adopted motto IN GOD WE TRUST was first placed upon the new two-cent piece of 1864. 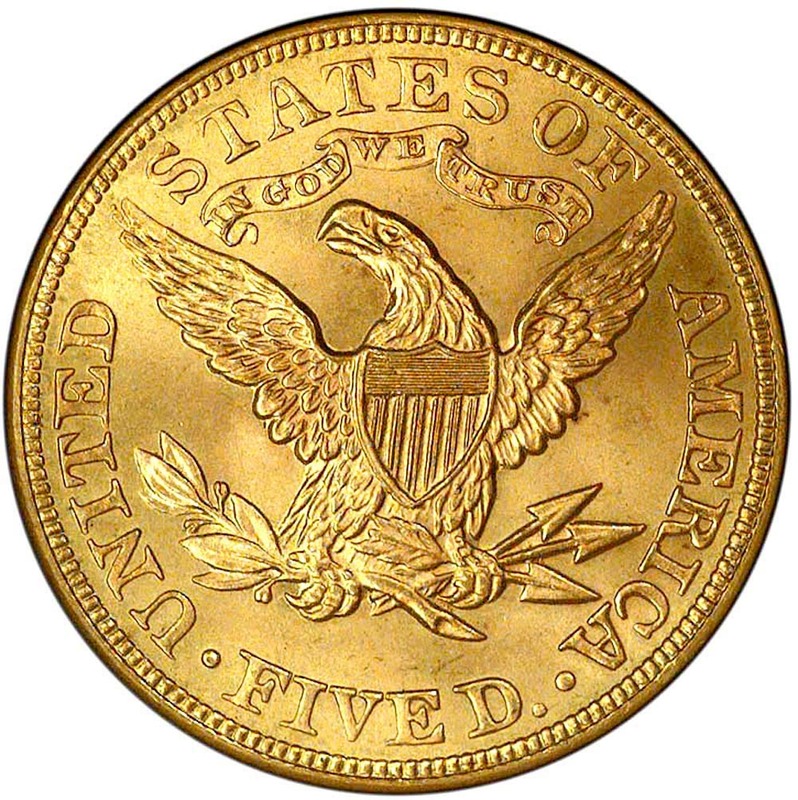 The $5 gold half eagle was familiar in American economic life. It had been in constant use since the early days of the Republic and was one of the longest lasting denominations in United States history. Half eagles would go on to see almost continuous production from 1795 to 1929, and throughout their life, they would not only be used in trade, but—in preference to almost any other gold coin—would popularly be found in Christmas stockings, especially in eastern towns and cities. The contemporary half eagle coin minted since 1839 and in use at the end of the war had been designed by Mint Engraver Christian Gobrecht. Gobrecht’s Coronet Liberty was a modified version of the John Reich/William Kneass “Classic Head” that had been in production since 1834. Liberty is depicted as thinner and more delicate than on the previous version. She is wearing a tiara engraved with the inscription LIBERTY, and her hair is tied in a bun with a string of beads. Thirteen stars surround the bust with the date positioned below. The reverse shows an eagle with outstretched wings, Union shield on its breast, perched on an olive branch and holding three arrows in its left claw. The inscription UNITED STATES OF AMERICA and the denomination FIVE D. encircle the eagle just inside the beaded border. In 1866, Gobrecht’s successor as Chief Engraver, James Longacre, added the new motto IN GOD WE TRUST to a scroll placed above the eagle’s head. In the years following the motto’s debut on the half eagle, the suspension of specie payments initiated during the war continued, precluding the need for large mintages of gold coins. Half eagles were made in relatively small numbers and hoarded along with the previous issues. When specie payments resumed in 1878, the half eagles were a convenient coin to redeem the large number of greenbacks still in circulation. By 1880 huge quantities were being made. More than 51,500,000 regular issue Coronet half eagles with motto were minted between 1866 and 1908, with the majority produced during the last 25 years or so of the design’s life. Only 2,938 proofs were made, with annual mintages ranging from 20 to 50 pieces in the early years to as many as 230 pieces in 1900. The mintage was large enough so that almost every date after 1878 is available, many in gem condition. Although most type collectors seek just one example each of the “no motto” and “with motto” types, a very popular collection is a set of Coronet half eagles from every mint. All would be “with motto” except the issues from the three southern mints, which generally would be “no motto” coins minted before the Civil War. The Coronet half eagle is unique in this respect, as it is the only coin struck at all seven mints—Philadelphia (no mintmark), Charlotte (C), Dahlonega (D), New Orleans (O), San Francisco (S), Carson City (CC) and Denver (D). Mintmarks can be found beneath the eagle. Collecting the entire series of Coronet half eagles with motto by date and mintmark is a daunting task since there are so many “holy grail” rarities prior to 1878. Every single date of this period is rare, with the exception of the relatively high mintage 1873 Philadelphia issue. Only several pieces exist of many dates in any grade, and some issues are simply unknown in mint state. Complete collections of Coronet half eagles didn’t exist in the 19th century, as collectors in that era collected by date only, ignoring the small letters identifying the mint’s location. It wasn’t until Augustus G. Heaton, President of the American Numismatic Association, published his famous monograph on branch mints in 1893 that collecting by mintmark became popular. Because of the lack of interest in mintmarks, many coins were not saved at the time of issue. Consequently, many early branch mint issues are not found in grades above VF. In 1908, the Coronet half eagle gave way to the Indian Head design of Bela Lyon Pratt, fulfilling President Theodore Roosevelt’s dream of an artistic national coinage. The new half eagle not only continued the use of the motto IN GOD WE TRUST, but incorporated the earlier motto E PLURIBUS UNUM as well.